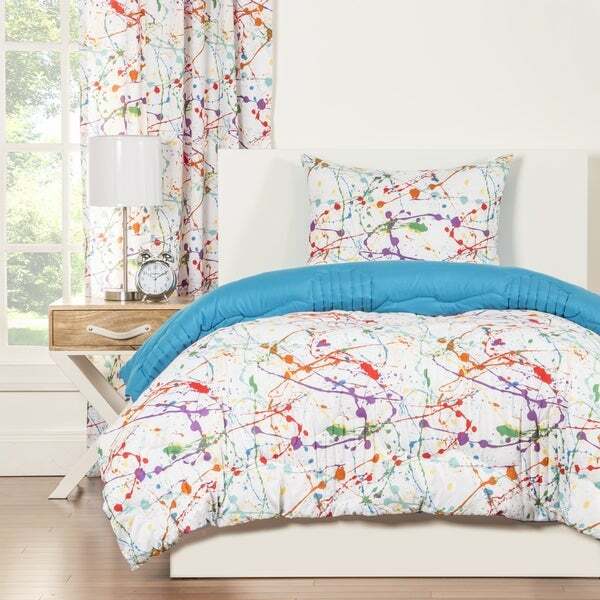 This Crayola Dream in Color bedding collection features bold drips of color splashed and splattered that is sure to inspire the abstract impressionist in all of us. A unique stitching pattern of squiggles and lines adds to its playful personality and lends attention-grabbing detail to the solid blue reverse side. The superb softness of the brushed microfiber will make this cuddly comforter the only one you want to snuggle with while you snooze. Love this. The colors are bright and it’s comfortable. Our son loves it. I need to order the crayon pillow as the bedding looks a little bland without it. It is a true queen size and really covers the mattress on both sides. This comforter is great. The colors are beautiful (what you would expect from Crayola). It is also extremely soft. It is not heavy but they say it is warm. I have no regrets. Love the comforter!! It was just the right color and my grandson loved it!! So colorful .... and soft !! The bright colors are wonderful !! Very pleased w/the overall quality. Can't wait for the grandbabies to see them !! Bought 2 bedspreads (twin over full bunk beds) for grandchildren's room for overnight stays. Needed a gender neutral print and this fit the need. It's a fun print and very colorful! The 100% polyester will be easy care but I personally would have liked some cotton in there - otherwise am very happy with purchase. i like the looks of this comforter, but it is a bit flimsy, and it isn't wide enough to cover our twin box springs, so I had to order covers for those, But I kept the comforter, as it is bright and cheery and looks great in a guest room that will also be used for my granddaughter when she comes to visit. I bought this for my teenage daughter. She absolutely loved the brilliant colours! Very happy with the purchase. It was just what I wanted. My granddaughter loves it. blanket are awesome and match with the coloring rugs. "Does this hold up for multiple washes? I’ve had a quilt I purchased from O at least 8 yrs ago and it still looks great. I tend to go for quilts for that reason but love the colors in this." Easy to match with other colors and sheets/pillows. Unisex design. Fun, but not too childish, design. My daughter is a little artist, and LOVE to color and draw. Boy and girl grandchildren in one room. Works perfectly!